Showing all 18 posts in September 2015. As some of you may know, I write the blog round-up column for MMO Games. I currently have a survey up on my blog where bloggers can self-report a few things about their blogs to make covering them even easier. If you've been covered already, then this isn't required but I suggest it anyway. There are a few questions that will help guarantee the accuracy of my reporting. I'd also love to get your feedback or just know you are okay being reported on. If you haven't been covered yet, then it is especially important for you to fill this out. Anyone who hasn't been covered already will be highlighted just for filling out the survey. Plus, it guarantees that I will be looking at your blog for the foreseeable future. There's no requirement that you focus mainly on MMOs or write only about MMOs, so feel free to fill it out and get noticed! When I proposed this award to @Belghast, I clearly didn't have any idea how much bigger this year was going to be compared to last year or how many Hearts you all were willing to give out. Nice learning experience and I'll likely change my method next year! I hope Anook served as a useful platform for you all and I'm hoping you all continue to share your writing with us for the rest of the year as well. I'm hounding our development team about making it easier for you all to do so, and our buddy @SurDaft just finished his latest version of the Anook WordPress plugin and a universal one still to come. One advantage to the vote method is nobody can Heart their own posts, so this really was all up the reading community. There was some really stand out posts that really drew in the Hearts but in the end, there was a definite winner who took the lead by a narrow margin. So congratulations to @Aywren! She'll be receiving Cities Skylines and one of our super-secret-I-promise-they'll-be-public-soon T-shirts! Thank you again to all you bloggers for making the event awesome and thanks @Belghast for making this a thing! The End of Blaugust 2015! Can't break the habit of blogging here. Oh no! 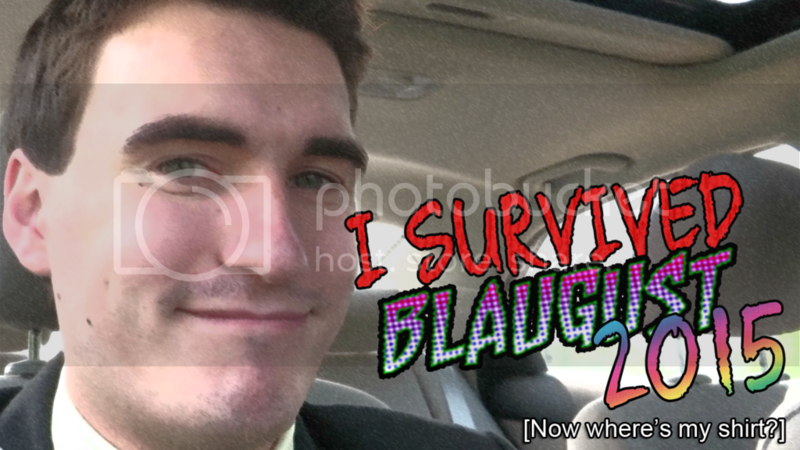 DAY 31 - I SURVIVED BLAUGUST 2015! Biggest Thank You to everyone for being a part of Blaugust and for being awesome and supportive. It doesnt end here though as I continue my journey to my 5th Year of Vlogging very soon. Blaugust is over... but I can still post fun articles right? I actually came across this idea THE DAY AFTER Blaugust finishes.... bah! Fun glamour ideas if you're a punchy punchy Roegadame! Blaugust is Over. Let’s Talk About it Later. Thank you Belghast and thanks everyone for reading and your support. This was a great way to start off a blog and I hope continue writing 'til sea swallows all! My experience at NXT Takeover: Brooklyn! It is done! Looking back on Blaugust. The cold can be one hell of an enemy.